If you're looking for an easy turn-key non franchise juice store or a space to convert to your concept, with a low price and growing customer base, then this restaurant is for you. 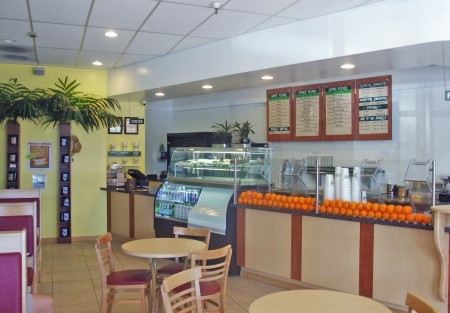 Located within a large shopping center, anchored by two large stores, this beautiful shop has 1,100 sq. ft., inside seating for 25, with a base rent of $2,875. There are two tables for outside seating. Grab this incredible chance to establish yourself on beautiful Alameda Island. Owner is selling to concentrate on other ventures outside the area. Nearby residential, marina, extended stay hotel, and office buildings help draw in the potential customer base. Other well-known quick serve restaurants and retailers are close by making this center a one stop shop for the local community. Take the next step and complete the online confidentiality agreement on our web page sellingrestaurants. You'll be provided with the restaurant name and address. There are also more photos available to our registered buyers. Also you will given priority notification to new listings in the future, prior to the general public, giving you the best chance to scoop in the best opportunities. A Paramount Restaurant Brokers, inc Listing.